THE first of five further strikes by RMT members on South Western Railway is under way. The walkouts are now set to continue for the rest of this week, and unless there is progress in talks over the on-train staffing dispute further strikes have been announced for all four Saturdays in November. The RMT says it is faced with a ‘threat to axe guards and roll out driver only operation’, although SWR has responded that ‘our growth plans mean more guards, not fewer’. Talks intended to resolve the dispute and end the stoppages have foundered repeatedly. A reduced service is running on most SWR routes during the strikes, although there are no services on the Hampton Court and Shepperton branches, and SWR trains are also not running north of Salisbury and Yeovil to Bath and Bristol via Westbury. Island Line is not affected. 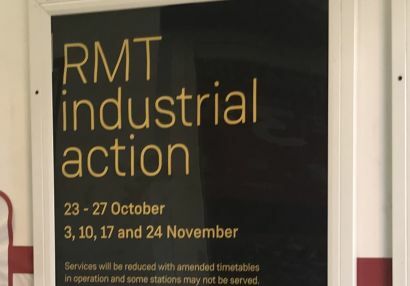 A South Western Railway spokesperson said: ‘The RMT is cynically targeting hard-working commuters, families trying to enjoy the half-term holidays and sports fans with its latest strike dates. RMT general secretary Mick Cash said his members were ’solidly supporting’ the new walkouts. He continued: ‘South Western Railway have deliberately stalled the talks process and slammed the door on union calls to negotiate around the guard guarantee which matches the widespread best practice in the industry. This dispute is about safety, security and access on South Western Railway while the company look to open up a loophole that would allow them to run services driver only at their discretion. ‘Recent figures have shown a shocking a surge in violence on our railways; it is frankly appalling that South Western Railway are looking for a green light to throw the guard off their trains as and when they see fit in the name of profit, regardless of the consequences. SWR might think it’s acceptable to play fast and loose with passenger safety, security and access but RMT members, who have stood firm throughout this dispute despite appalling harassment from the company, will not accept a dilution of the safety regime on the railway.